We’ve been dialing in the crop plan for the season, our calendar and final seed orders. It’s as though each year, come spring, we pick up a whole series of juggling pins and then spend the next several months trying desperately, clumsily, joyfully and exuberantly to keep them all up in the air, juggling through the season. Sometimes we lose a pin or two. We might try and scoop them up, or we might just let them go and keep the others circulating. That’s the routine. Juggle. Toss up and keep catching. This year, with our usual juggling pins we’ve also picked up a flaming torch. We’re planning a trip to Norway mid-summer to celebrate the wedding of two very special lovebirds, Jeremy’s brother Nicholas and his hjertenskjær, Veronika. As may be easy to imagine, the prospects of leaving the farm mid-growing season have us …in a state of nervous agitation. To be very clear: we’re looking forward to celebrating these two, to time together with family, a chance to work on our midnight sun tan, and we’re feeling mighty lucky to have an opportunity and the ability to make this jaunt around the world and the chance to explore Jeremy’s native grounds – it’s just a funny management puzzle that has us scratching our heads. We’re looking forward to sharing another season with you all! October?! Yowzahs! How did this happen?! Here are some highlights from the last couple months. Scroll through quick and it should have that fun flip-book effect. High pitched, redshift, here is our summer, in review, in fast forward. Our big project this summer has been building the pack shed. The original plan was to have it finished before CSA started in June, but we may have been over estimating ourselves – by a year. The pack shed is a covered 16’x25′ concrete slab with a storage loft. We will run all the water and electric from above, so we can make changes as we figure things out. The construction crew has been primarily Jeremy and his father, David. We’ve had gracious and timely help from friends for heavy lifting and pouring concrete. And Trish gets to pound nails, sometimes. We had a few excellent friends come out to visit this summer. Beyond being much appreciated and additional willing, working hands, we so love all the smiles, good conversation, and inspiration. Thanks for coming by the farm, friends, it’s such a treat to have you here. This has been our first full season with our farm stand. Overall, it’s been a good season, though it’s clear we need to address some marketing issues, namely, we need to do some marketing. A sign might help. We have a good core customer base and we’ve really enjoyed getting to know people as they return each week, hearing about recipes they’ve tried, sharing sourdough starter and swapping cook books. Our original intent was to set up an honor system till at the farm stand, but the weekly interaction we get with folks is something we’ve grown to really value and, so far, being open only Saturday mornings, we’ve been able to prioritize the time and have at least one of us be there. This Saturday will be our final farm stand for the season – come by and load up. We’re enthusiastically learning more about biodynamic agriculture and ways we can incorporate this practice on our small farm. There are elements to biodynamics that resonate strongly with us (the farm as a whole living system, focus on soil health, importance of animals, community involvement, observation and meditation, we’ve found the planting calendar is super useful…), and then there are other parts we haven’t quite wrapped our heads around. A few weeks ago we buried biodynamic preparation 500 near our barrel compost. The first weekend of October, we took a quick trip down to visit our friends Beth and Nathan at their farm in Scottsbluff. They hosted a workshop on integrating seed production with small scale vegetable farms. This is something we have been interested in doing here and we’re especially grateful to have the opportunity to learn from these thoughtful, generous, experienced growers. It was good to learn some new seed cleaning techniques as well as improve our understanding of producing seed from biennial crops. (and a quick side note: as winter settles in and your fireside seed dreaming starts, check out Meadowlark Hearth. They grow good seed.) It was a good summer for bugs on the farm. So many good ones, including burying beetles. This past Sunday we butchered our laying hens. These ladies were 2-4 years old, the oldest of which were our very first chicks. Good, sweet birds; they taught us a lot. We are replacing them with the young flock that’s been scooting about in tractors in the orchard this summer. The new layers will likely start producing eggs in a month or so. We’re hugely grateful for our evisceration crew. It’s so delightful having friends with bright attitudes, minimal squeamish tendencies, and an interest in avian anatomy. Thank you for helping make the morning go so smoothly, respectfully, efficiently. And thank you to our customers for helping to support local, humanely raised, good meat. We’ll be butchering the fryers (young roosters, 20 weeks) this upcoming weekend, if you are interested just let us know. These old laying hens make incredible stew. And schmaltz. Jeremy made a leek and onion broth soup with some of the unlaid eggs. He made pad thai with the rest. (Trish prefers the unlaid egg pad thai over the unlaid egg soup). Radish has had this expression on her face ever since we started dehydrating livers and gizzards. Last week we celebrated our final CSA pick up of the season – with parsnips and leeks, and our best onions yet. This wraps up our fifth CSA season and has us feeling a bit nostalgic, extremely thankful, and completely humbled by how much we have yet to learn. From the very bottom of our hearts, thank you for joining us this season, CSA friends. We’ve enjoyed sharing the harvest with you each week. CSA isn’t for everyone, it’s a special commitment, it requires patience and trust, and a willingness to be flexible and creative – thank you. We appreciate you for accompanying us on this adventure, for all your support and smiles. Thank you for getting as excited as we are about celery, for telling us about how your sweet little one’s very first non-milk food-food was a Shintokiwa cucumber, for making and puttin’ up pesto, more pesto that you know what to do with (we promise, you’ll be happy about this come February! ), and for learning to love beets. We hope that you will join us again next year! Throughout the CSA season we encouraged share members to either walk or bike to the farm to pick up their vegetables. Of course, it’s not always easy to do (or feasible) and we wholeheartedly understand busy schedules, but we do love the idea of taking the opportunity to stretch your legs after a long day, head over to pick up fresh vegetables at the farm, feel the sun on your face, hear the birds singing… all the while saving the planet from a short trip across town in the car. Over the course of our 20 week CSA season, there were over 80 trips made by bike or foot! THIS IS HUGE! Thank you, thank you, thank you! We’ll be drawing names from the pie lottery next week, so expect a call from us soon. That about covers it. Thanks, friends! Quite possibly the world’s most photogenic beets. are in our CSA shares this week, mostly Chioggia, some Early Wonder Tall Top. We have been having a hard time getting even germination with our direct seeded crops (beets, carrots, parsnips, peas). In this beet bed we filled in gaps with a planting of lettuce. The lettuce made for excellent companion planting and a fun beet harvest/hunt, but it’s not the abundant yield of beets we were scheming for back in February. Look here for this week’s CSA newsletter, a list of what’s in the share, and a recipe for parsley chutney. Having Trish’s mom around these past couple weeks has been great fun and lots of thoughtful conversation. We’re getting a lot of good work done – especially early morning weeding parties with hot coffee and Miss Marple (Agatha Christie books on tape). We’ve discovered that heart-racing whodunnits are fantastic for cruising through rows of parsnips and peas. Mom has not only helped us out with marathon weeding, but she’s also introduced us to a new farm tradition: margaritas while seeding fall successions. The farm stand signs have been getting dusted off and (some) repainted. Things like Gooseberries and Citron are getting painted over to read Garlic Scapes and Arugula. The original signs were painted by the Schuttlers in the 1950’s. Some of the other crops/products they grew/made/sold include sand cherries, horseradish, plums, apple cider, fat hens, rutabagas, beet greens, fresh eggs, sweet corn, pumpkins, strawberries, dill… Many thanks to our number one farm friend Kaija for helping trace letters and cut out stencils and to Mom for her steady hand and smart spelling. This week we also harvested seed from our kale breeding project. In 2012, we ordered a breeders mix from Adaptive Seeds. Since then we’ve been planting out, overwintering, and selecting seed from good looking survivors. We’re excited to cultivate a kale that is not only especially adapted to the soils, climate, and winters of Spearfish Valley, but also tastes delicious and withstands a fair amount of weed pressure and neglect from busy farmers. Things are all lined up, greening and blooming. Here is a view inside the field tunnel (left to right: shishitos, eggplant, beets, cucumbers, chard); trellising in the greenhouse looks like the inside of a piano; a photo of the two of us together! ; and the eggplants are flowering. And lastly, most importantly, some love to our parents – without your steadfast encouragement, support, and love we wouldn’t be able to do any of this. We are so very grateful for your wisdom and profound patience. And for your help. And for finding joy in our ridiculousness. We love you heaps. A Spring Plant Sale on the farm! Mark your calendar! Tell your friends! We’re excited to be hosting a fancy pants fancy plants sale this spring, offering a selection of what we find works best for us in this area as well as a few new-to-us varieties of garden vegetables, herbs, and flowers. All of our plants have been started from seed on the farm, they are all open-pollinated and grown using organic practices. Come by the farmstand, explore the gardens, peek in the greenhouse, and take home a few plants. Farmstand sale days will be Saturday April 30th, 9 to 1, and again Mother’s Day weekend, Saturday May 7th, 9 to 1. Starts will be available for purchase and pick up at the farm during the week as well and throughout the month of May, please give us a call to arrange a time to come by. Initially we’ll have herbs, flowers, brassicas (kale, cabbage, broccoli, etc.) for sale; tomatoes, peppers, eggplants, additional tender herbs and flowers will be available starting in mid-May. We are delighted to be offering tomatoes grown from our own saved seed, as we’re working on regionally adapting several varieties. We will also have fresh vegetables for sale – lettuce, radishes, mustard greens, scallions, bok choy; as well as eggs, farm flower seeds, and fun, hand crafted goodies, including pot holders and wooden spoons. Also, friends! Check out this great introduction to soil health, a presentation given at the 2012 Quivira Coalition Annual Conference by Jill Clapperton (just about a 1/2 hr). She offers insights on nutrient cycling, cover crops, mycorrhiza, no-till – both educational and entertaining. We think you’ll enjoy this. And as you’re planning your garden this spring and readying beds for planting, think about your living soil and what a privilege it is to steward. Thanks for your support and happy spring! We have been having much deliberation about the season, a lot of ruminating on time, finances, and the Farmers Market. Right now we’re feeling enormously swamped on the farm, too much to do, only two people, not enough time. We’ve decided we have to miss the Saturday market this summer. This has us feeling torn and disappointed, we love the market so very much. However, we’re also really looking forward to having the additional time to spend in the field and finishing projects. 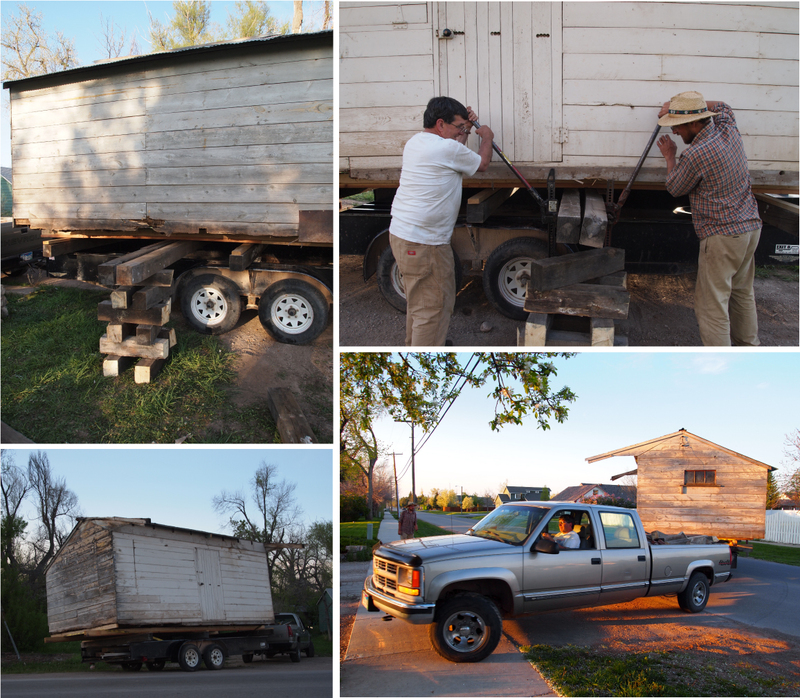 One of the projects we’re especially excited about is fixing up an old farm stand, which we’re planning on using for our CSA pick-up and for on-farm sales. Our hope is that we can still make our produce available to customers while being here to manage the farm, care for critters, tackle chores, etc. We’re still finishing construction/repair on the farm stand and haven’t yet set open hours. Please stay tuned. We hope that you’ll stop by the farm stand and see us! Of course, you should also hop on your bike and go visit our friends at the Farmers Market too! A bit more about the farm stand: This farm stand was originally built by the Schuttler family in the early 50’s on their farm property at the corner of Evans Lane (then Lower Valley Rd) and Old Hwy 14. They sold everything from honey and canned jams and jellies, eggs and herbs, potted plants, and a whole array of diverse vegetables and fruits. All seasonal and local and amazing. 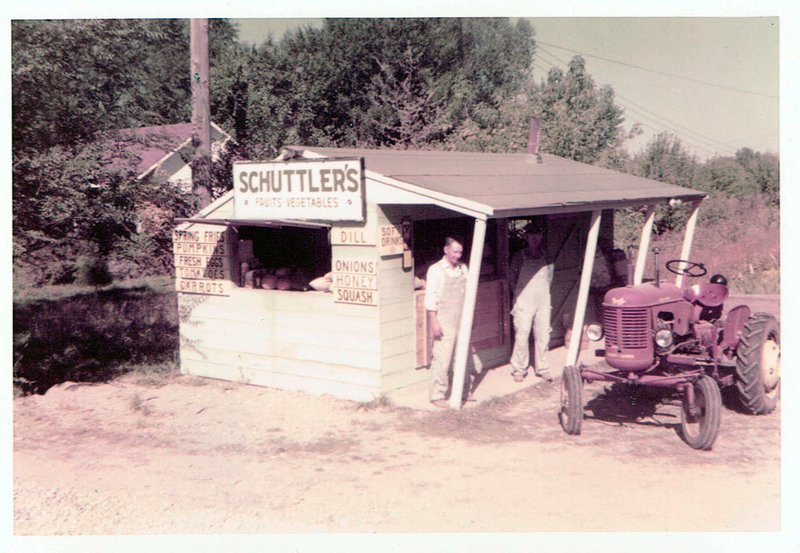 This is a photo courtesy of Linfred and Ron Schuttler of their parents’ stand in operation. The Schuttler’s family farm was called Lumbago Acres, aptly named because it had a ‘crick in the back’ – before the highway was built, Spearfish Creek flowed along the north property boundary, through the back of the farm. The stand was last used as a market space in 1976. Here is a shot of the farm stand at the original farm, circa 2013. 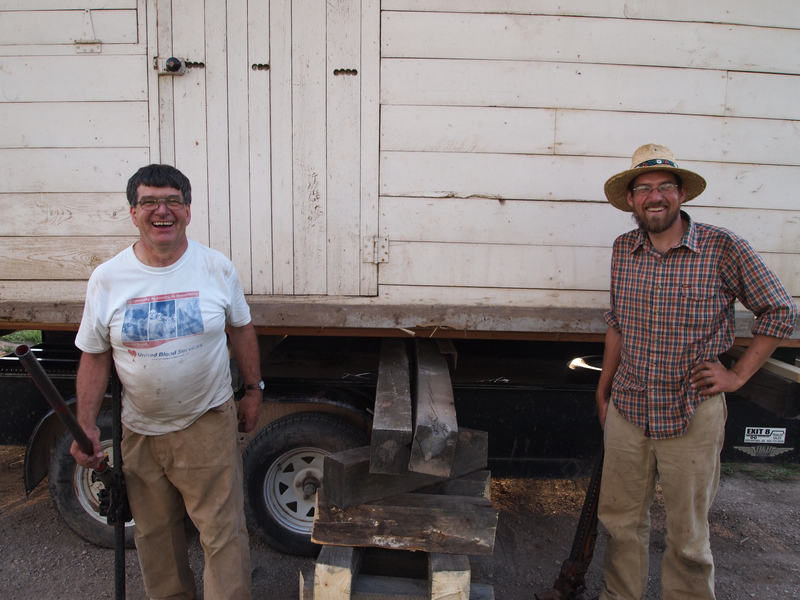 When we first moved to Spearfish to start farming, Ron Schuttler graciously offered us the stand if we could figure out a way to move it. For three years it’s been on our to-do list (indeed it’s printed on our business card). This spring, we contacted a couple big-truck towing, fork-lifting, hauling companies to see about having it moved, but were repeatedly warned that due to rot and age, moving it would crumple it. Jeremy and his father, Dave, were confident in its structural soundness. Jeremy had already transplanted the lilac hedge. It would move just fine. Together, the two jacked it up, corner by corner, on bricks and beams and coffee cans and marbles. Such a good team. Once it was up high enough, Dave backed a trailer underneath. Once here, in the driveway, they reversed the process jacking it down, corner by corner. Finally, setting it down on boards. 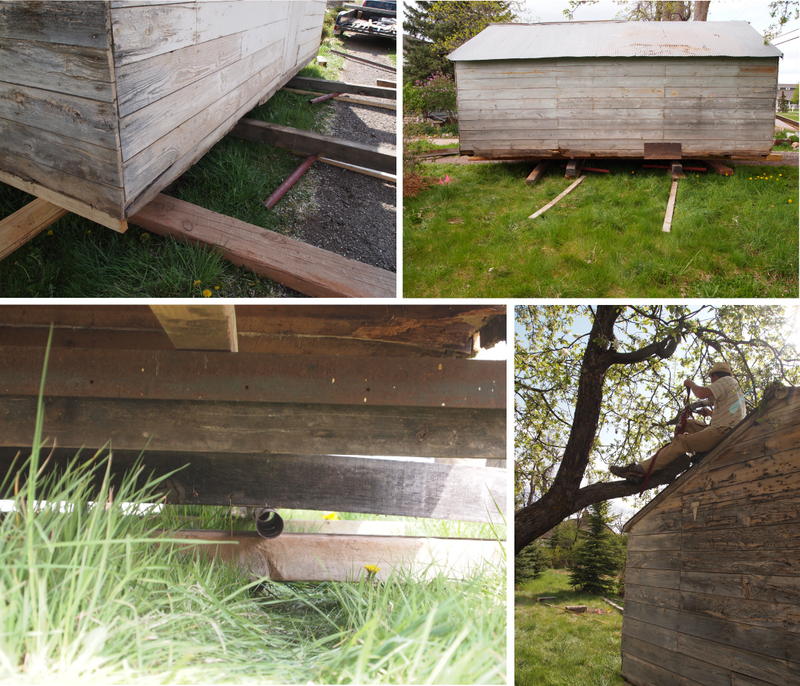 Using pipes as rollers and fun trigonometry, a tiedown strap to lift a crab apple branch out of the way, a come-a-long and moxy, the farm stand found its way into place at Cycle Farm. Between time on bed prep and planting in the field, we’re working on getting the farm stand usable. The rot is cut out. It’s now sporting a fabulous new porch, with great rocking chair potential, and new roof boards. Even after 40 years unused, the farm stand is in remarkably good condition. It’s such a great space. Everything so smartly laid out and built. Complete with, hinged counters, shelves, hanging produce signs, and a wonderful, little sliding glass window in the back. 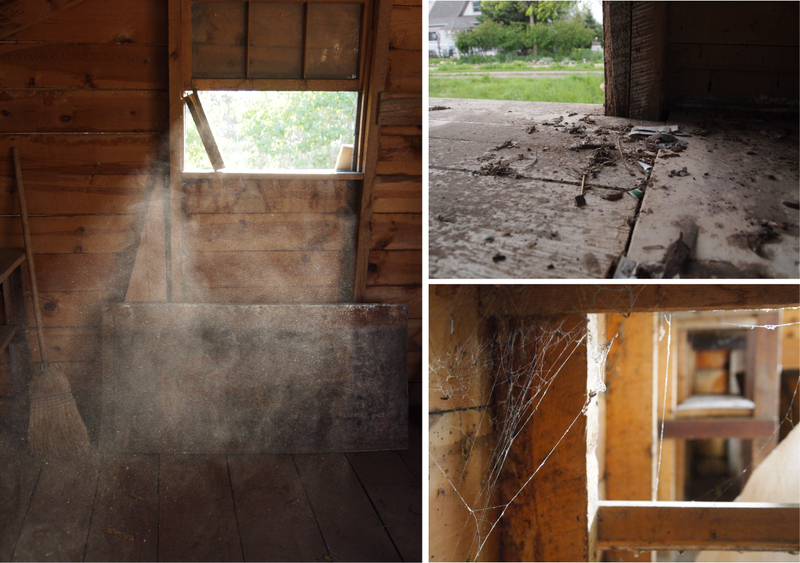 The counters and shelves inside are all preserved well under a generous layer of dust, spider egg casings, and cob webs. Newspaper comic strips stapled to the walls, and photos of brown trout and bass, and pretty ladies with horses tacked to the ceiling. There’s an incredible, rich history to this space, as part of Spearfish Valley agriculture and small family farming, and we feel honored and privileged to get to be a part of it. We’re planning having the farm stand ready for our first CSA pick-up on Thursday (oh sheeesh). We’ll also be selling produce fresh from the farm through the farm stand all season long. Look for updates on our facebook site as to what’s available. Or check out the smart signs posted on the side of the stand. We hope you’ll come by and visit us. An update! 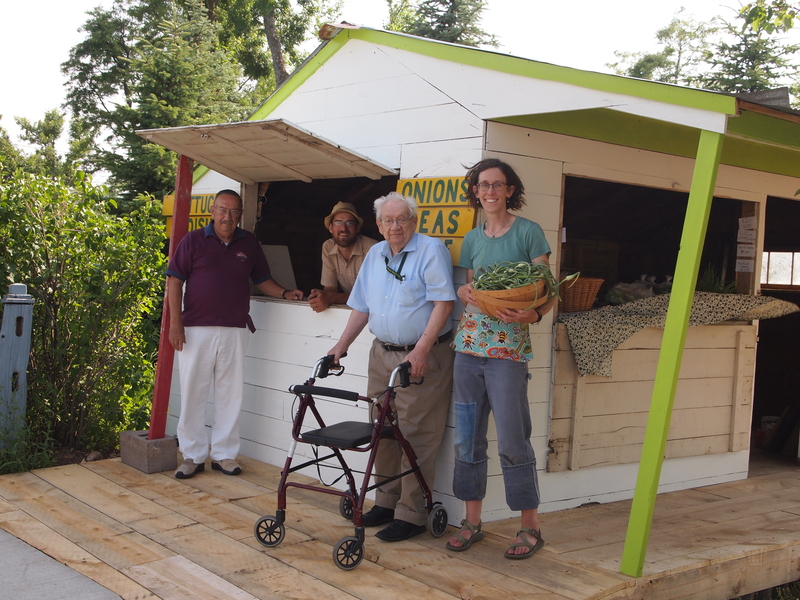 Since posting this, we had the chance to spend an afternoon (July 3rd) with Linfred and Ron Schuttler on the porch of the farm stand. Some of this great conversation, history of the farm stand and agriculture of Spearfish Valley was recorded in this great article from the Black Hills Pioneer, Restoring — and restocking — a Spearfish farm stand.